Immigration cards are often handed out on the ferries. Fill them out to speed up passage at the border. For EU citizens, a visa is not necessary. If you’ve arrived in Ceuta, then follow eastbound to Fnideq. After about 5 kilometres you will reach the Moroccan border. If you’ve arrived in Tangier Port, you will be guided directly to the border crossing shortly after you leave the ship. At both locations, the so-called ‘fixers’ will be waiting for you. These are local people who want to assist you with border formalities. Some carry an official ‘tourist badge’. If you want to make use of their services, they will expect a tip. The use of a ‘fixer’ can certainly help smooth your passage through the border (especially if you do not speak French). Always keep track of the whereabouts of your documents and do not leave your car unlocked. A recent review of Chris Scott on border procedures for Morocco can be found here . Tip! Do not take too many valuables with you. At this border, luggage will be checked thoroughly and valuable goods must be declared. You may even need to pay a deposit, to be reimbursed at the end of Morocco in Dakhla. Many times, I have seen cars and minivans being unpacked completely. Goods for personal use are not a problem. Thorough checks are carried out by customs and soldiers. As a rule, the less stuff in the car, the easier the passage. Warning! Do not bring any maps or literature where the existence of Western Sahara is recognized or displayed. This is a politically very sensitive matter. You can can read more about it here (Wiki, Western Sahara). It is generally good practice not to discuss political issues in Morocco. Morocco is a beautiful country full of variety and definitely worth getting off the highway to admire the country in all its beauty. To learn more about contemporary Morocco you can look at the website Bladna.nl (in Dutch language). The country has an extensive road network and you can drive up to Agadir on good highways (toll). 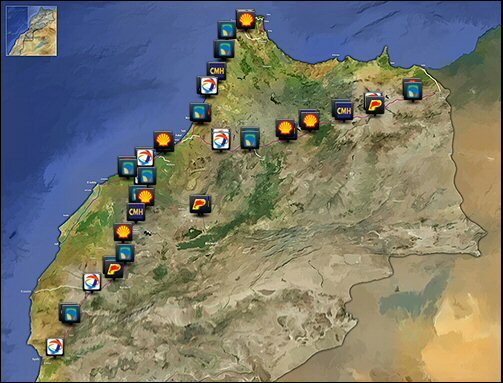 For detailed information on the Moroccan road network you can check here. Some things to consider: There are many police speed controls (often with laser guns). Do respect the speed limits at all times or else, a drive through the country may turn out to be very expensive. If you drive on secondary roads, you should expect more checkpoints, especially after the town of Agadir. Often they are located at the beginning of towns. Warning! Make sure you follow up on the instructions when approaching checkpoints. There is usually a stop sign well in advance, however, it can sometimes be placed on the ground and difficult to spot. Stop at this sign completely until you are instructed to approach. Do this slowly. Appearances are deceptive: Sometimes it can take some minutes before being signaled or it seems like no one is there at all (especially at night). Once at the checkpoint, ask if they want to have a ‘fiche’. Don’t ever just drive straight through. 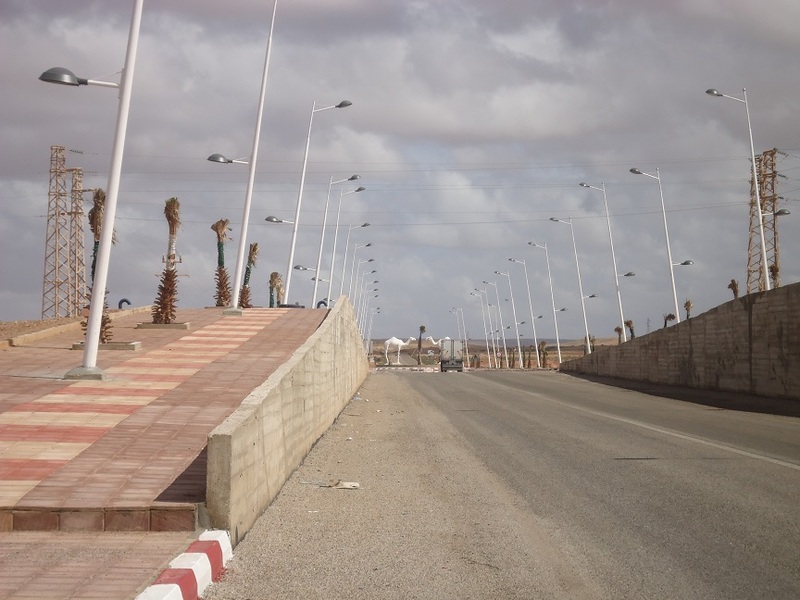 There is a large roundabout at the end of the town of Tan Tan when heading towards Tarfaya. The traffic on the roundabout has priority so you must stop. Usually, there isn’t a vehicle in sight and you will feel tempted to ride on. Don’t do this. Ensure you stop for some time. If you don’t stop, on the other side, the police will be waiting for you! With the exception of the highways, driving at night is not recommended. Take account of bad roads, donkeys(carts), pedestrians, mopeds driving the wrong way, vehicles with dazzling lights or no lights at all, total darkness or stranded vehicles. Morocco has plenty hotels to spent the night and they are relatively cheap. Prices ranging from 15 to 25 euro a night are common. You can also sleep in your car: Many parking lots (at fuel stations) along the highway are guarded by security. There are also opportunities to camp. I have no experience with this and can not be of any help regarding this. Please check the aforementioned Sahara Travel Forum. The last few hundred kilometres overland towards Mauritania are characterized by vast and lonely areas. In the far south, you will pass the city of Dakhla. Although a small detour (80 kilometers) , the city offers every opportunity to eat and drink well, stay overnight and fill up on gas. From Dakhla, the fuel becomes more expensive. Although today, it’s possible to get a visa at the Mauritanian border, it is recommended to get your visa in advance in Rabat. I will discuss how and why, in the next part of this series.